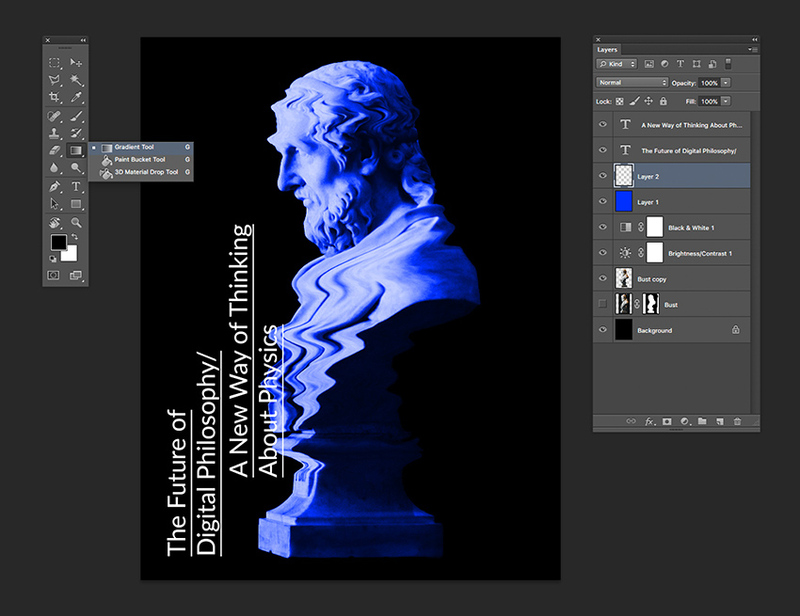 For this tutorial, we will design a poster using the Liquify Tool on a traditional object in Adobe Photoshop to give it a digital feel. Find more poster and flyer template inspiration over on GraphicRiver. Open the bust photo in Photoshop. 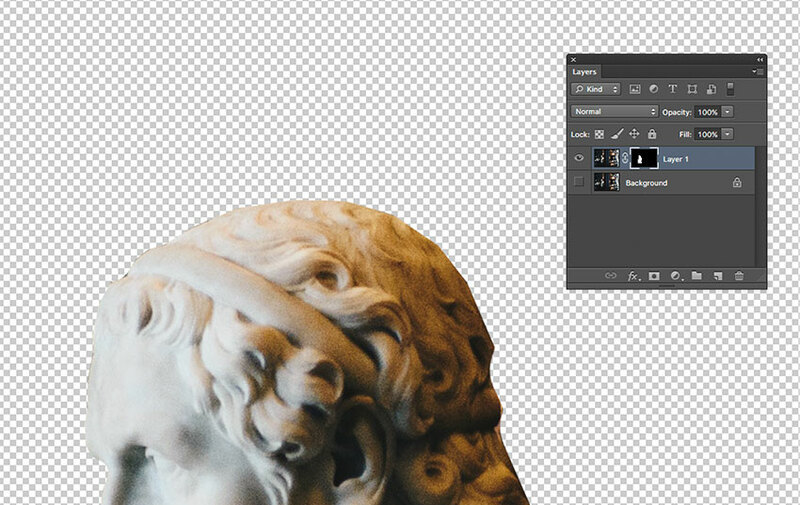 Before using it on the poster, we will remove the background and use the bust that is in focus. 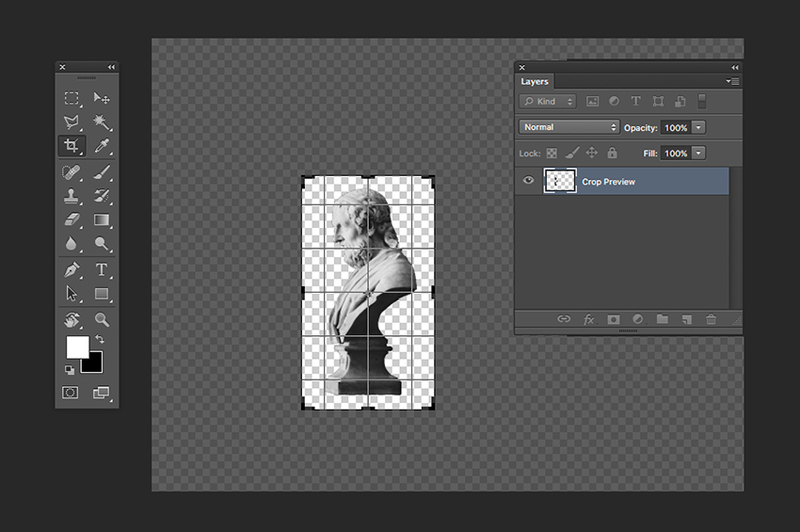 To do this, in the Layers panel, Duplicate the Background layer by pressing Command-J. 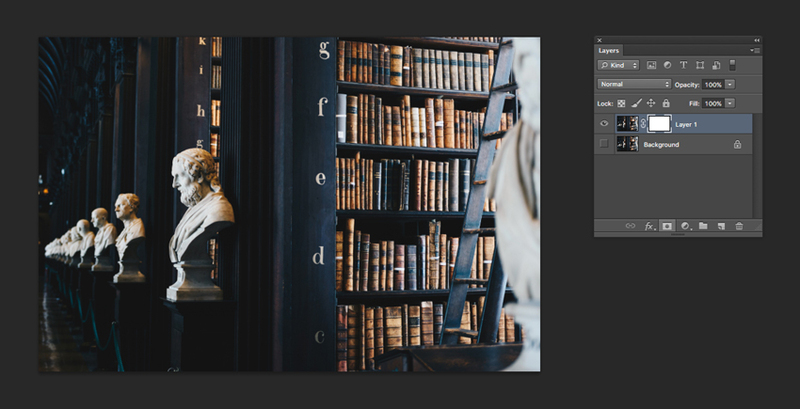 Click on the eye icon to Hide the visibility of the original Background layer. 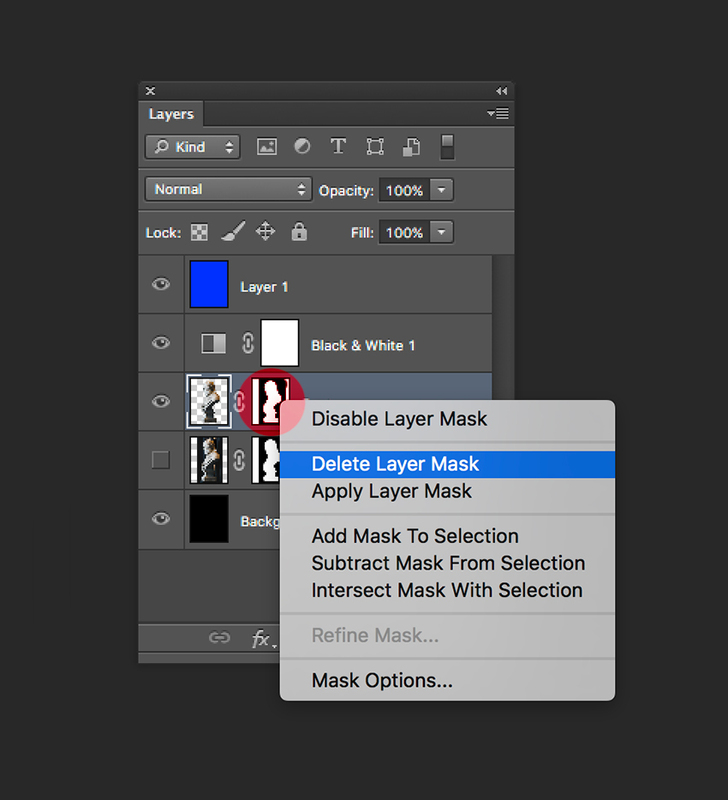 While selecting the new layer in the Layers panel, click on the Vector Mask button to add a Layer Mask to Layer 1. 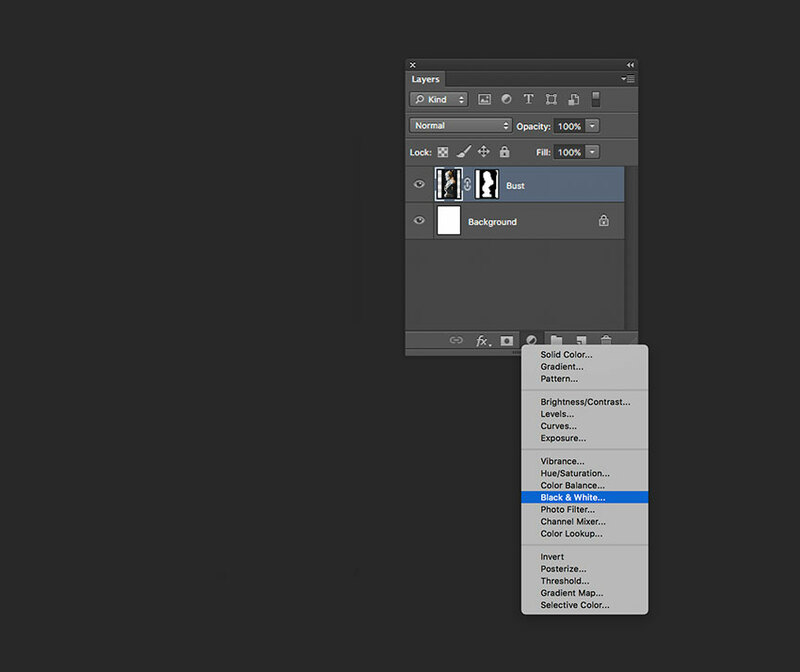 While selecting the new Layer Mask, select the Brush Tool (B). Use black as the foreground color and paint over the image to erase the background. Once we have painted over most of the image with the Brush Tool (B), we can Zoom in (Z) and work on the details. If needed, tap the backslash key () to display a red overlay on the layer mask. This is useful to check if we have erased the right parts of the image. Let’s go ahead and crop the image using the Crop Tool (C) and crop the bust to a manageable size. In Photoshop, go to File > New. 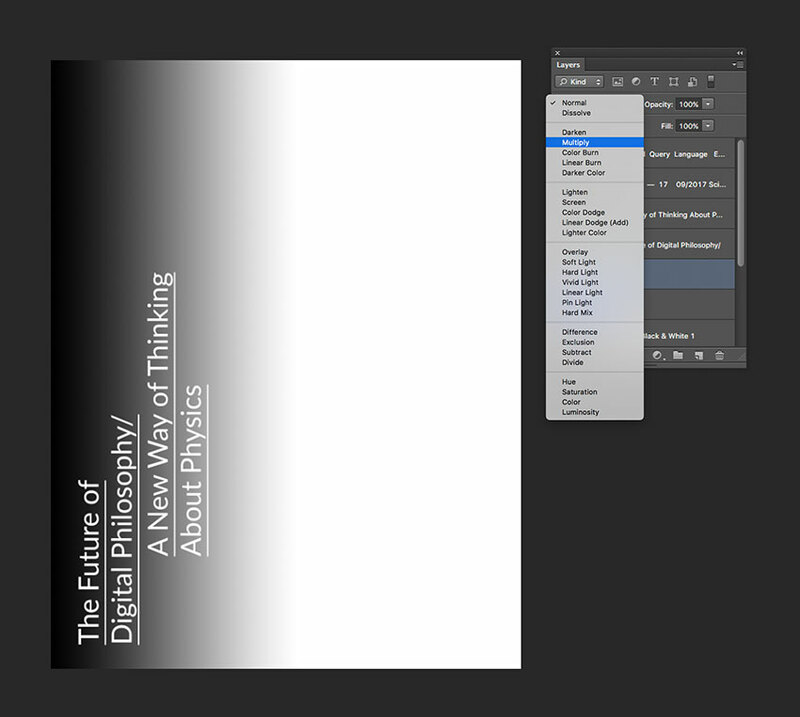 Name the document The Future of Philosophy, and set the Width to 1275 px and Height to 1650 px. I am using this composition as an online pamphlet, so I will be using 72 dpi with Background Contents White. Click OK to create the document. Activate the rulers by pressing Command-R. 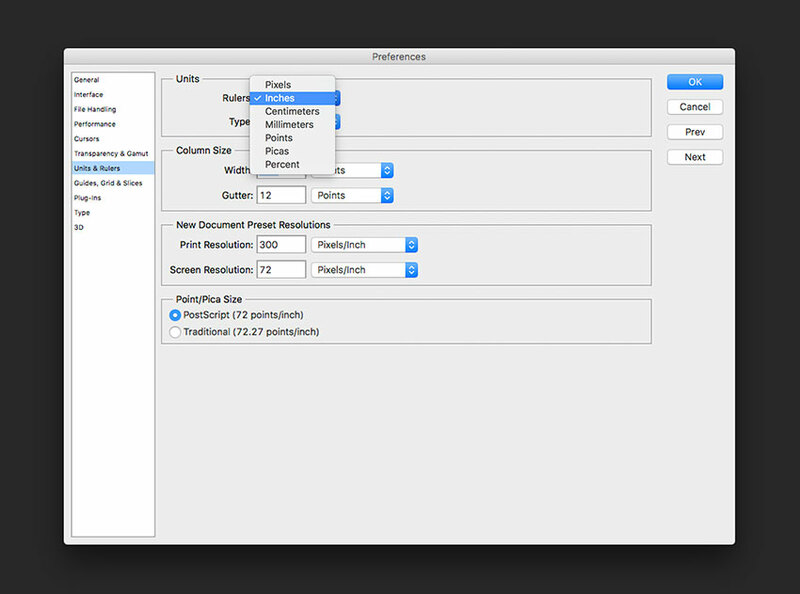 I am using inches—you can change this by going to Photoshop > Preferences > Units and Rulers. Click on the rulers and drag towards the page to create guidelines. I’ve set mine to 1 inch on each side. Hold Shift to drag the guideline to an even number. 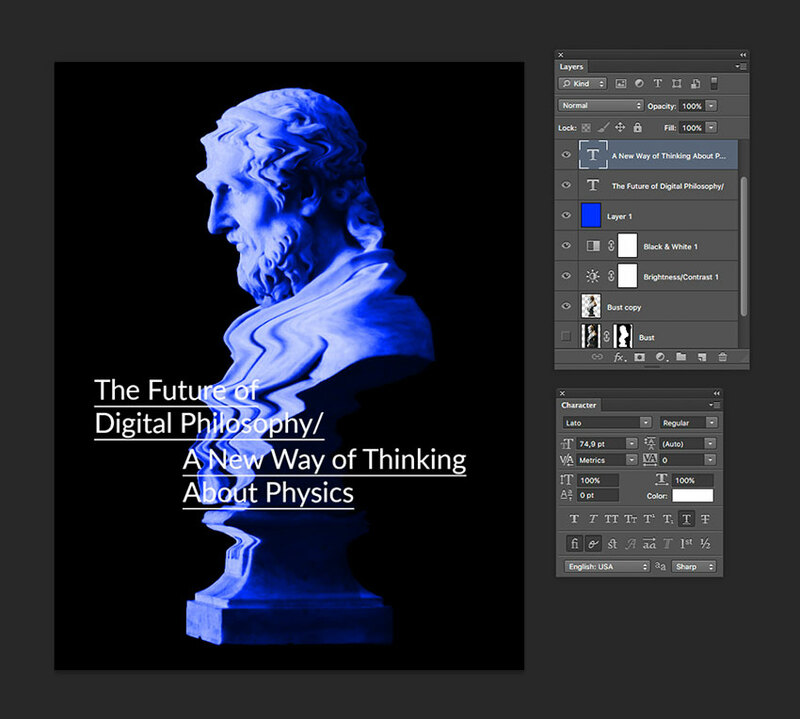 Let’s duplicate the bust layer with the layer mask onto our Future of Philosophy file. To do so, select the layer and Right Click > Duplicate Layer. 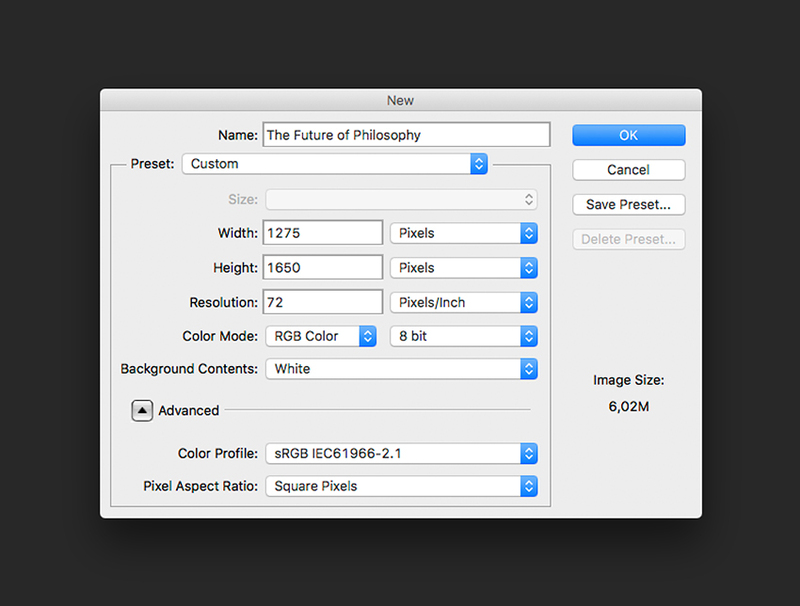 Under As, change the name to Bust and select Document > The Future of Philosophy. Click OK to continue. Let’s make the image smaller by using the Transform Tool (Command-T). I am leaving about 1 inch on the top and the bottom as margins. You can hide the guides by pressing Command-;. Select the background layer and paint the layer using the Paint Bucket Tool (G) and black as the foreground colour. The image is looking yellow in tone, so let’s manipulate it to give it a futuristic feeling. 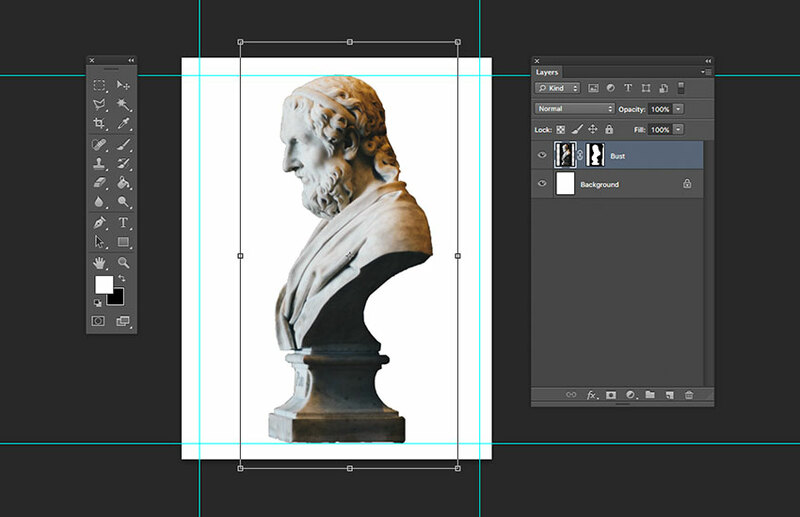 On the Layers panel, select the Bust Layer and click on Create New Fill or Adjustment Panel > Black & White. This will add a layer on top of our image without committing to turning the image itself Black and White. The Properties panel will open up, and we can adjust the colours that are turning black and white. The highlights are looking too burned and we are losing some definition, so let’s look for the blue colour and move the slider to the left. That looks better! To make it even more futuristic, let’s add a blue overlay. On the Layers panel, click on create a New Layer. Using the Bucket Tool (G), select a foreground colour of blue with the following code: #0030ff. Paint over the layer and set the Blending Mode to Overlay. 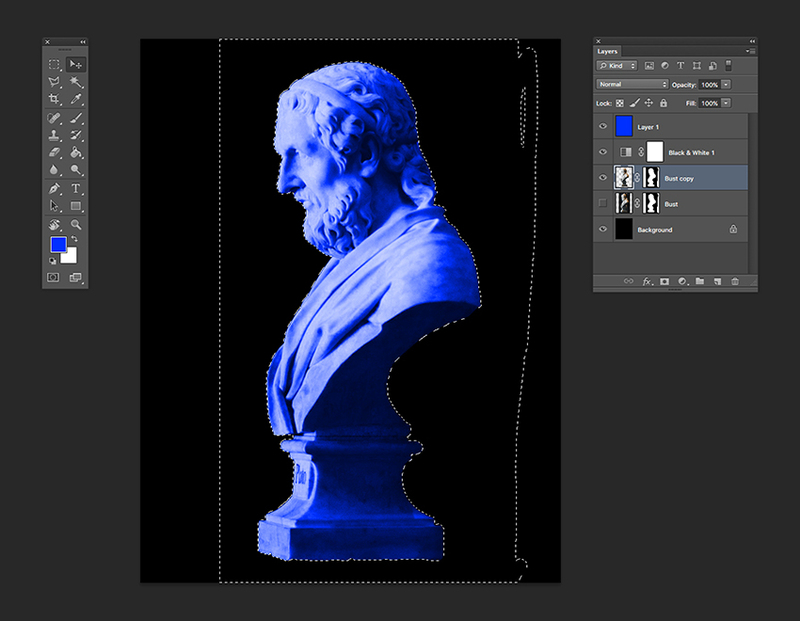 Select the Bust Layer and duplicate it by pressing Command-J. 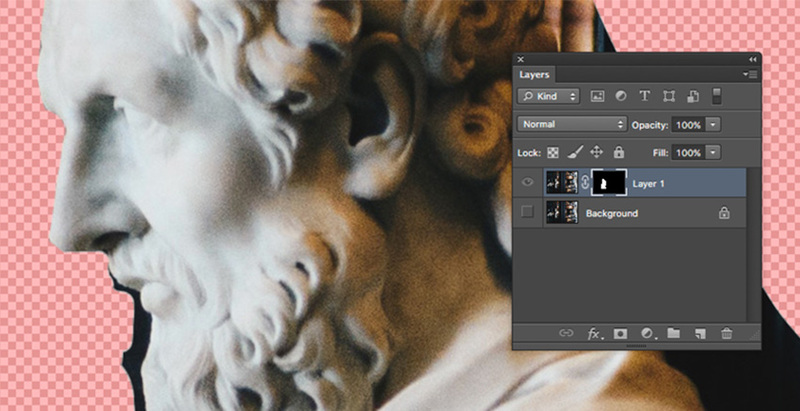 Hide the visibility of the original layer by clicking on the eye icon, and go back to the copy. We need to keep the masked image only. If we go ahead and use the Liquify Tool, we will only see the results on the spaces the mask is revealing. 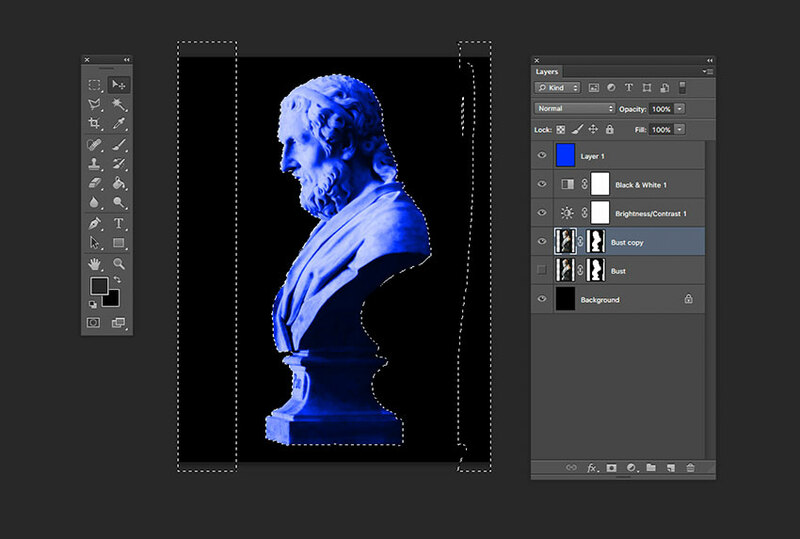 While selecting the bust layer, hold Command and select the Layer Mask. This will select the spaces we didn’t hide at the beginning. Make sure that the bust layer is selected and not the layer mask. We want to delete the opposite of this, so let’s inverse it by pressing Shift-Command-I and Delete. Deselect by pressing Command-D. Delete the Layer Mask by clicking on the layer mask, Right Click > Delete Layer Mask. Go to Filter > Liquify (Shift-Command-X), and a new window will pop up showing the selected bust later. 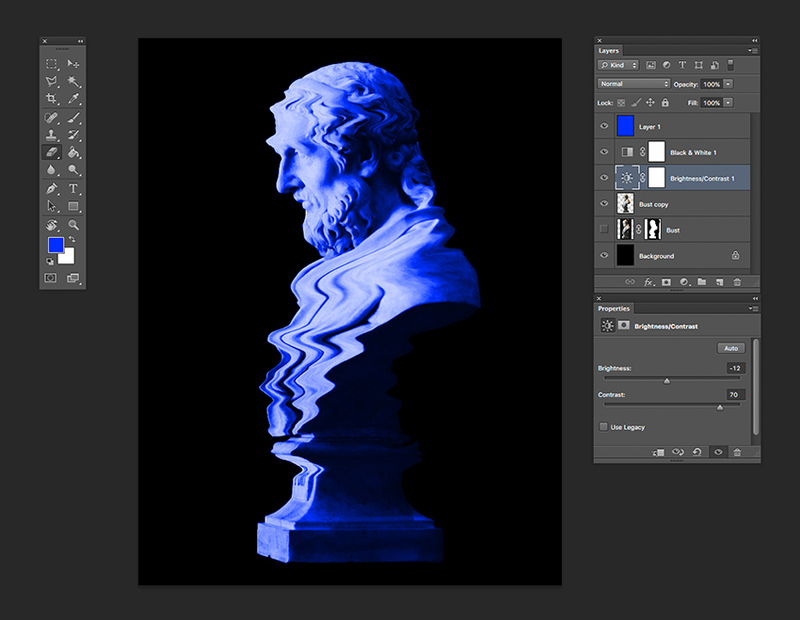 For this specific image, we want to create a digital glitch look. Let’s use the Forward Warp Tool (W). On the right side of the window, we can tweak the Tool Options. Since we want to make small glitches, we can start with a Brush Size of 150, Brush Density of 100, and Brush Pressure of 50. We can now brush over the image. Feel free to experiment with other settings! Once you are done, click OK.
We have our image almost ready. 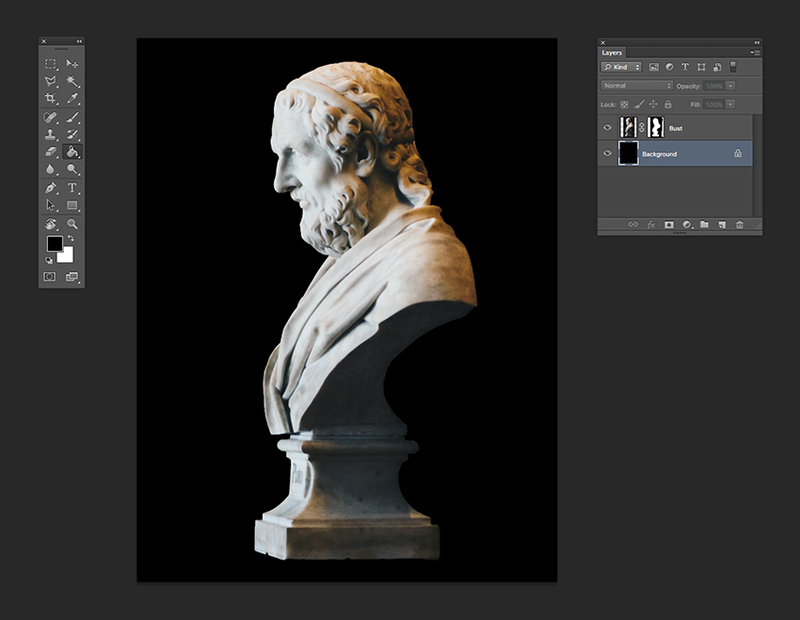 To give a more digital look to this traditional bust, we can reinforce the brightness and contrast. 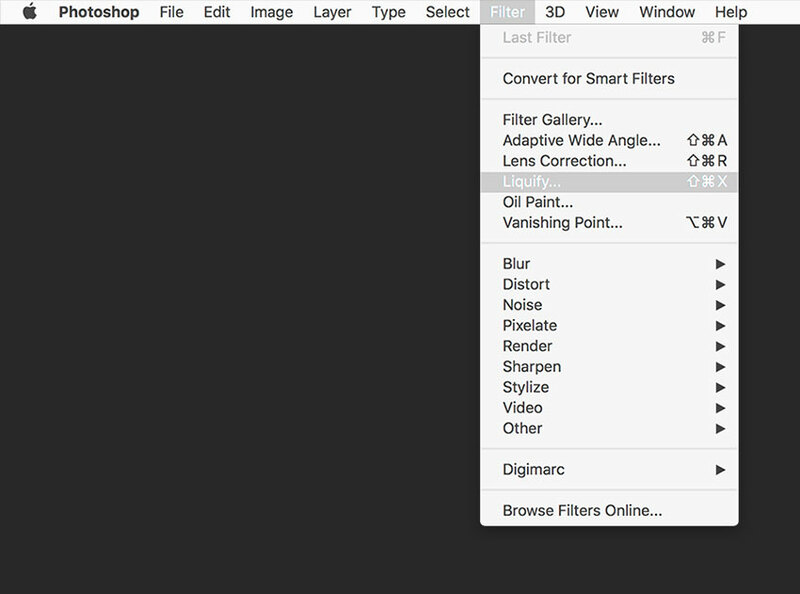 At the bottom of the Layers panel, click on Create a New Fill or Adjustment Layer > Brightness/Contrast. The Properties window will pop up, and we can adjust the settings to Brightness: -15 and Contrast: 70. 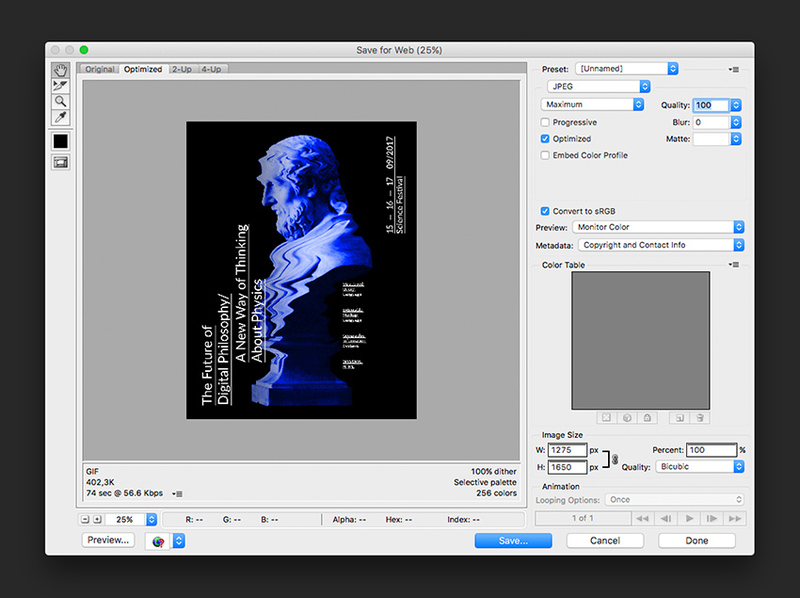 In order to create a contrast with the horizontal lines we created on the bust, we will use vertical text. Press T to add a new text layer and add other details. Set the font to Lato Regular, at 75 pt in white, and select Underline on the Character panel to add prominence to the title. I also used two text boxes for the title of the poster. 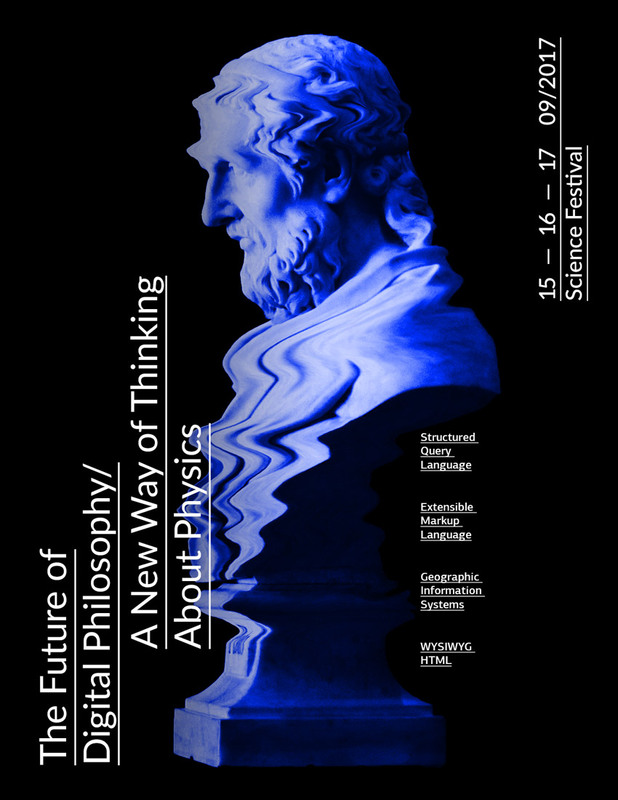 In the first, type “The Future of Digital Philosophy” and in the second, “A New Way of Thinking About Physics”. Select both of these text boxes by clicking on one, holding Shift, and clicking on the other. Rotate by pressing Command-R and hold Shift for an even rotation. Let’s place them on the bottom left corner margin. You will notice that the white text is slightly conflicting with the image. 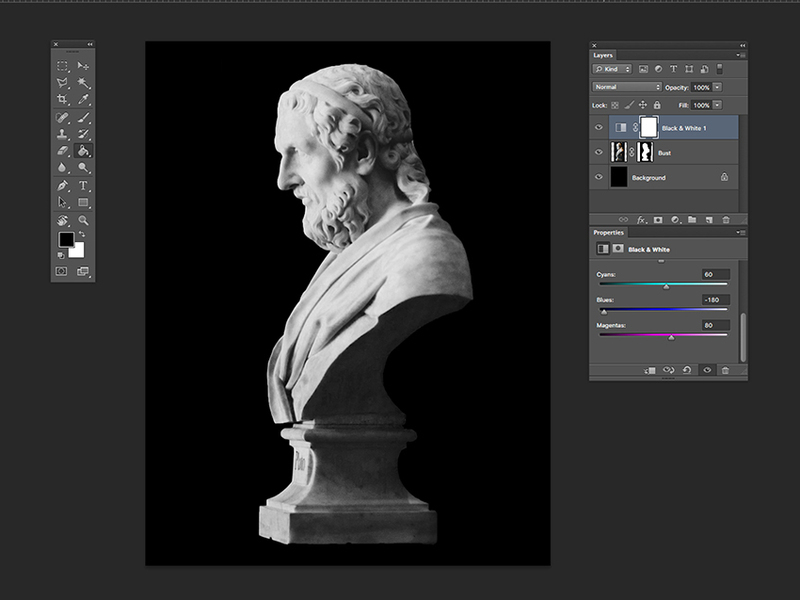 Let’s add a gradient to darken the bust. 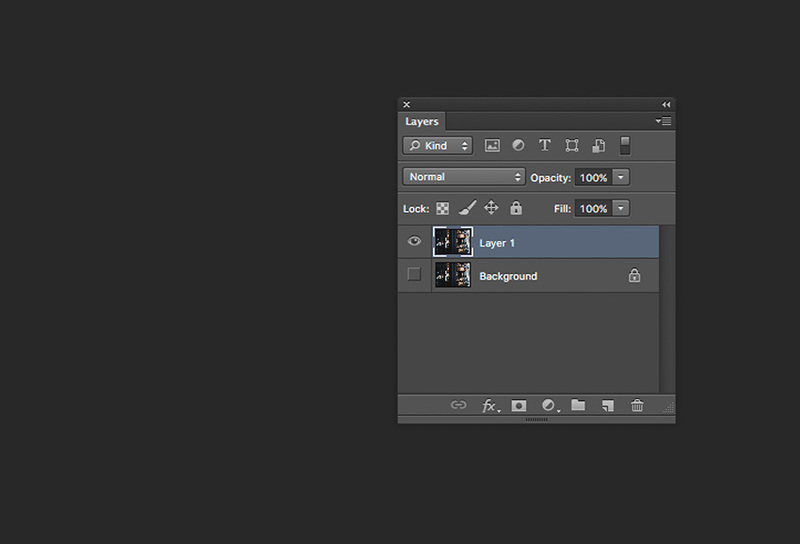 On the Layers panel, select the blue layer and add a new layer. 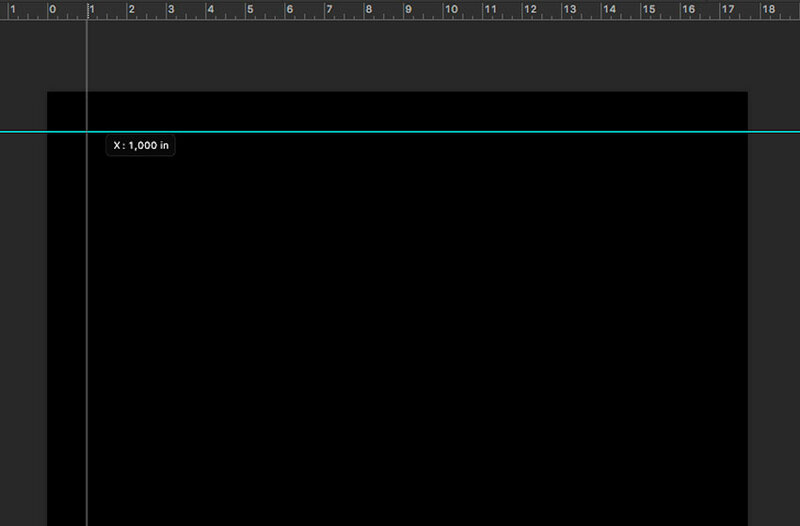 On the toolbar, select the Gradient Tool (G). 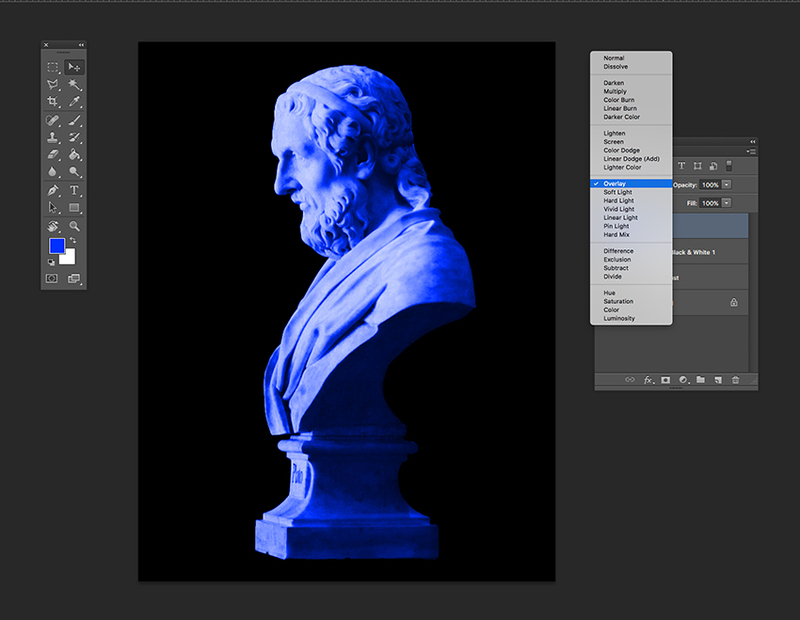 Set your background and foreground colours as black and white. 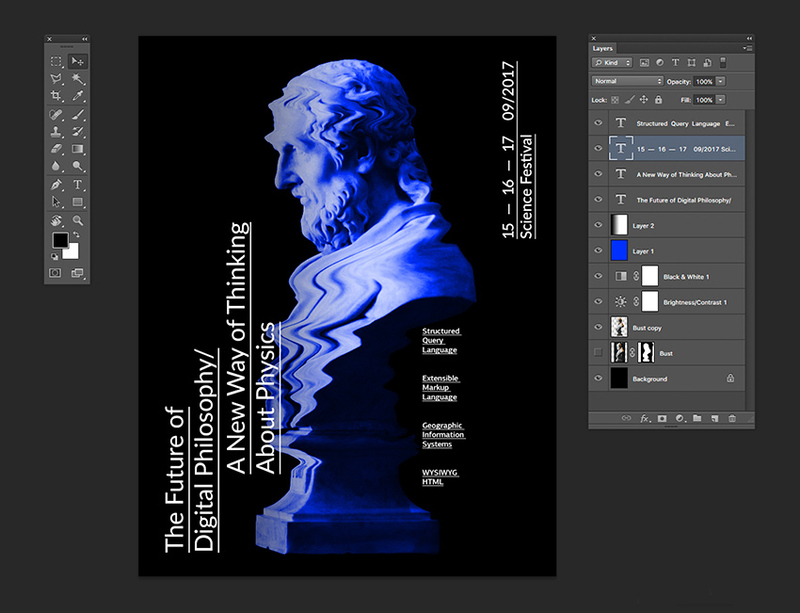 Drag from the left side of the poster to the centre to create a partial gradient. Let’s set the Blending Mode for this layer to Multiply. Now let’s add more details to our poster! Using the same Text Tool as before, we can add more components to bring it to life. I added dates and the kind of event at 46 pt in size, and to create balance on the poster I placed this text on the opposite side to the title. I also added bits of information parallel to the bust to reinforce the theme of the event and add another layer of detail with the same character style, but this time at 18 pt in size. Click File > Save As to save the file as a .PSD to later edit it. For a lower-resolution web jpeg, click File > Save for web (Shift-Option-Command-S) to save the file as a .JPEG. Here you can alter the quality of the image and the image size. Click on Save… and save the file. Congratulations on Finishing This Tutorial! Use Adjustment Layers to tweak images endlessly. 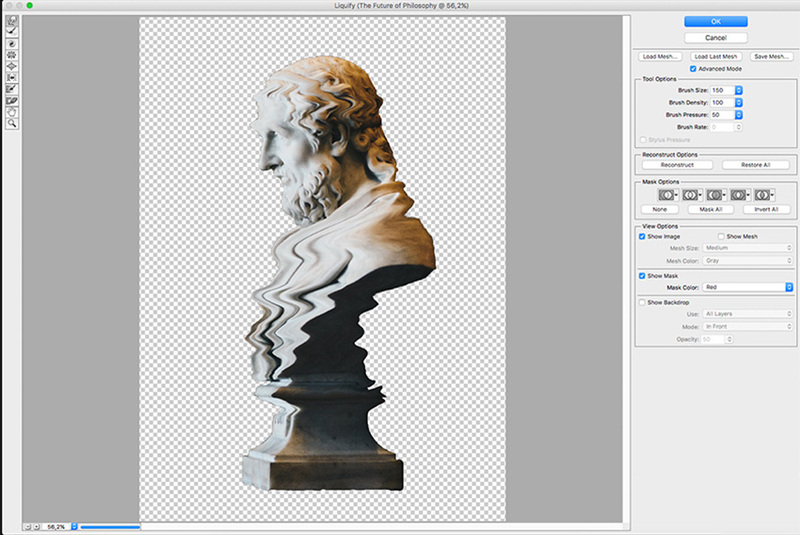 Use the Liquify Tool to change a traditional object into a digital one. 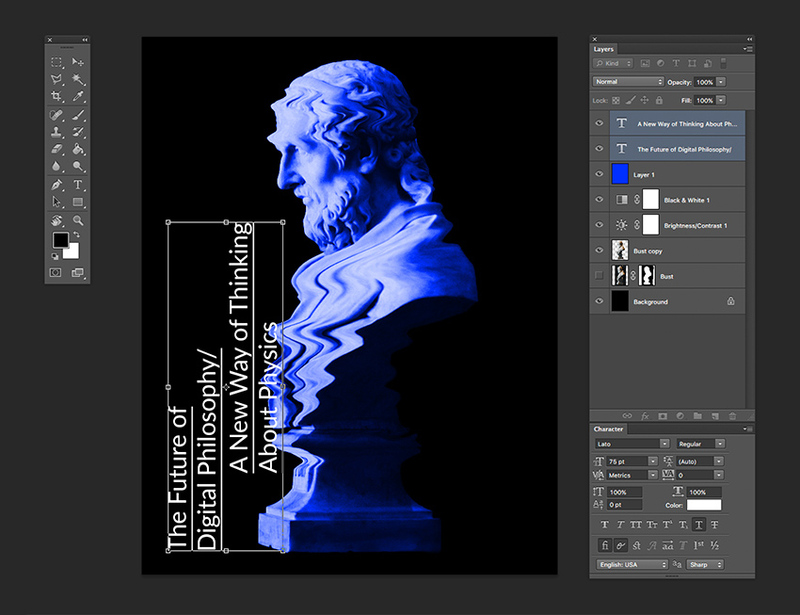 Format typography and use it in different directions to interact with the image. CoffeeShop “Dream Catcher” Fine Art Photoshop/PSE Action!